In celebration of U2’s recent series of re-releases and in anticipation of their upcoming studio album, The Hurst Review continues its series highlighting the band’s most underappreciated and overlooked recordings. In this installment: 1993’s Zooropa. Click here for the first installment, 1982’s October. With more Grammy awards than any other band in history and tours that fill the biggest stadiums in the world– sometimes for several night in a row– U2 is, without question, a populist band; even at their artiest and most experimental, their songs are full of heart and laden with big hooks and arena-ready choruses, so it’s no wonder so many of their songs have already become classic rock radio staples. Nor is it any wonder that Zoorpa, the follow-up to their landmark album Achtung Baby, is also one of their poorest-selling, for never before has U2 made an album so deliberately insular and cerebral, so difficult to penetrate and taxing to listen to. Capturing the band at their most experimental and abstract, the album remains one that many admire but few love, that lone U2 album that makes no concessions to radio or offers the listener any easy entrance points; it’s high on concept and and low on anything familiar. In other words, it’s arguably the only U2 album that sounds nothing like a U2 album. Nowhere on any of its ten songs will you hear the familiar, ocean-deep guitar sounds of The Edge or the kinds of euphoric choruses that packed out arenas in the 1980s, nor will you hear any of the hip beats and flirtations with industrial rock that made Achtung Baby so volatile. The Edge performs lead vocals on one song– a weird, montone rap– and Bono sings some of his material in a super-high falsetto; meanwhile, Johnny Cash is the features vocalist on the final track. One song, clocking in at around seven minutes, sounds like it was nicked from a Prince album. And oh yeah– it’s also a futuristic, sci-fi concept album. Understandably, longtime fans were a bit baffled, and some still are today. In particular, the band’s large Christian fanbase doesn’t always know what to make of this record, as it finds Bono adopting his devilish MacPhisto persona and spinning tales about falling in love with a woman on TV, succumbing to the “Numb”-ing affects of a culture obsessed with escapism, throwing away the keys to the kingdom given to him by his Heavenly Father, and, in the end, leaving his home and his wife with nothing but a Bible and a gun, and no intention of coming back. 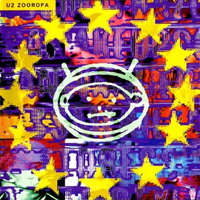 But of course, part of Zooropa’s message is that surfaces can be deceiving, and this song cycle is much more than meets the eye. In fact, it’s the most unified and cohesive album-length statement the band has ever made, and it’s achievement is singular: It’s a concept album about the Prodigal Son, or, as the last song terms him, “The Wanderer.” More specifically, it’s an album about how we’re all prodigals, lost in a world that’s bent on seeing our demise, and it’s only by the grace of God that any of us stand a chance. The title cut sets the tone, as its druggy, narcotic haze eventually peels back to find Bono reciting some lines from then-current marketing campaigns before revealing the heart of what the album is all about: “And I have no compass, and I have no map/ And I have no reason, no reason to get back… And I don’t know the limit, the limit to what we’ve got.” Bono’s Wanderer is paralyzed by the overload of pleasure and experience around him, confused about what’s real and what’s merely an imitation, lacking any kind of moral direction or spiritual clarity. Maybe he’s singing about the culture as a whole; maybe he’s singing about himself. The rest of the songs flesh out on these concepts, with the allegorical re-telling of the Prodigal Son parable, “The First Time,” serving as a the key that unlocks the rest of the album. And musically, U2 shows a similar wanderlust, venturing farther off the beaten path than they ever had before, making their least accessible and most sophisticated and dense album ever. The music perfectly mirrors the themes, too, as with the sinisterly ironic bells and chimes of “Babyface,” an ode to lust in the information age that sounds almost like a lullaby, or on Edge’s weird rap litany on “Numb.” Even Cash’s craggy, rugged voice feels like a part of the album’s fabric when he shows up to give voice to the chief character on “The Wanderer”– and who knew Bono could pull off such a spot-on Prince caricature (on “Lemon”)? This is U2 at their bravest, their artiest, their most insular and conceptual– which is why you’ve never heard these songs on the radio, or played at concerts. Only one song, the aching ballad “Far Away (So Close),” sounds like it belongs on a U2 album. But that’s half the brilliance of this album; U2 has developed such a distinctive sound, it’s remarkable to hear them so completely cast it aside for something so utterly different. Never before did they pick a theme and work it so thoroughly as they do here, and that alone makes this not just their most difficult album, but also one that pays off some of the highest dividends.